“The .380 was a cute fad,” Springfield Armory’s print ads proclaim. “Now, let’s get back to business.” Back to business indeed. Forty-five caliber single-stack striker fired pistols aren’t exactly a new thing. Kahr and Glock have been making them since the naughties. Truth be told neither model has been flying off the shelves. But no one has made a pocket .45 this small. Our small-handed man Dan got to grips with the XD-S at this year’s SHOT Show and loved it. But is the new XD-S really all that and a pocketful of protection . 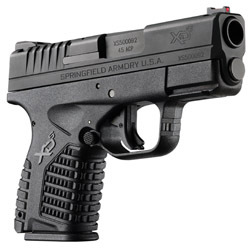 . .
Read More Here: “The Truth About Guns” Review: Springfield Armory XD-S .45 ACP.